This section on area 2.8 includes all the measures aimed at fostering and increasing the presence of CAMPUSHABITAT5U in platforms and international academic-scientific networks and alliances. the constitution of a postgraduate and doctoral school in conjunction with the university/hub with the best capacity to generate synergies. 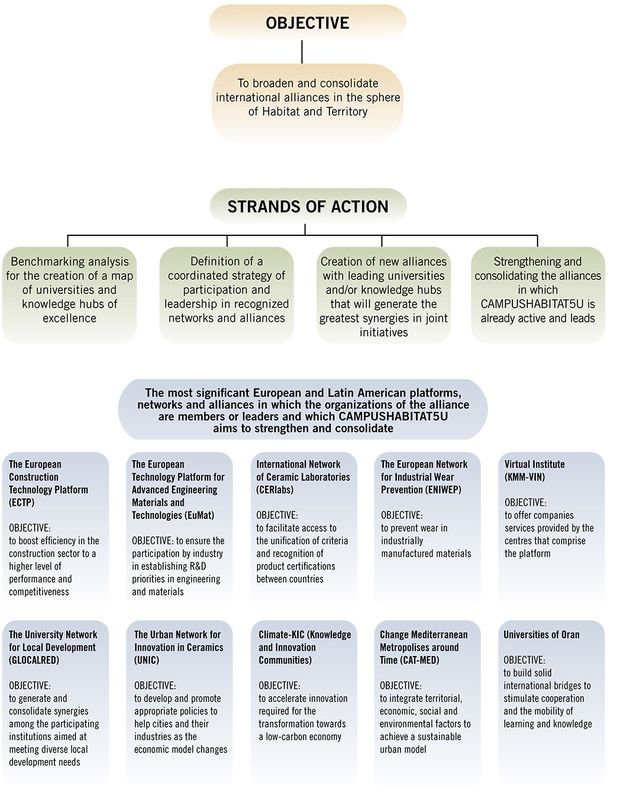 Information is given below on the most significant European and Latin American platforms, networks and alliances in which the organizations of the CAMPUSHABITAT5U alliance are members or leaders and which CAMPUSHABITAT5U aims to strengthen and consolidate. preserving and restoring cultural and architectural heritage for the benefit of society and the enrichment of our cities. The European Technology Platform for Advanced Engineering Materials and Technologies (EuMaT)CAMPUSHABITAT5U is a member of this platform through the ITC.The objectives and activities of EuMat are framed within the “Construction” area of action of the CAMPUSHABITAT5U project. Specifically, its goal is to ensure the optimal degree of participation by industry and other stakeholders in the process of establishing R&D priorities in the area of advanced engineering materials and technologies. EuMaT seeks to improve the consistency of current and future R&D projects conducted in the EU in the field of materials. International Network of Ceramic Laboratories (CERlabs)The network is made up of nine laboratories in eight European countries (including the Institute of Ceramic Technology). The member countries of CERlabs represent 90% of the world sales of tiles.The objectives and activities of CERlabs are framed within the “Home” area of action of the CAMPUSHABITAT5U project. Specifically, the goal of CERlabs is to facilitate access to the unification of criteria and recognition of product certifications between countries. The European Network for Industrial Wear Prevention (ENIWEP)The ITC is an active member of the network, which is made up of a total of 26 well recognized organizations from 17 different countries.The objectives and activities of ENIWEP are framed within the “Construction” area of action of the CAMPUSHABITAT5U project. Specifically, ENIWEP is involved in the prevention of wear in industrially manufactured materials. The European Network of Excellence (KMMNoE) from which the current Virtual Institute (KMM-VIN)is co-directed by CAMPUSHABITAT5U through the ITC. It is made up of 34 organizations, research centres, universities and companies and focuses on research into advanced materials.The objectives and activities of KMM-VIN are framed within the “Home” area of action of the CAMPUSHABITAT5U project. Specifically, KMM-VIN focuses on the study, understanding, design and development of new advanced materials such as ceramics and metallic ceramics and combining these to yield better mechanical properties and improved functional characteristics.The purpose of the new virtual institute is to offer companies services provided by the 25 centres that comprise it, both as individual providers and in conjunction with one another. Furthermore, this institute can channel proposals from companies or research centres to the 7th Framework Programme of the European Commission. Therefore, the objectives and activities of GLOCALRED are framed within the “Social Setting” area of action of the CAMPUSHABITAT5U project. The goal of GLOCALRED is to generate and consolidate positive working synergies among the participating institutions aimed at meeting diverse local development needs and generating development proposals though the academic environment in harmony with its surroundings. Furthermore, the UV and the UJI are jointly responsible for the doctoral programme in local development and territory. The goal, as with the master’s degree programme, is to expand the offer of this programme to other European and Ibero-American universities. Within the framework of the Regions for Economic change initiative of the European Union, the Urban Network for Innovation in Ceramics is made up of eight cities in eight EU member countries with a long history in the ceramics industry and ceramics production, including Castellón de la Plana.UNIC has been chosen by the European Urbact II Programme as a themed network under the aegis of the area “Cities, drivers of growth and the creation of employment.”The objectives and activities of UNIC are framed within the “Planning and Management” and “Social Setting” areas of action of the CAMPUSHABITAT5U project.The primary challenge facing the UNIC will be to develop and promote the right policies to help cities and their industries in these times in which the economic model is undergoing such drastic change.This will be accomplished through cooperative projects in the area of teaching, research and innovation.Efforts towards internationalization of the postgraduate body and R&D in this area are aimed at higher education centres based in these cities, including CAMPUSHABITAT5U through the UJI. Furthermore, the consortium places regions in a leading role as “regional communities for the implementation of innovation”. The CV is one of six such regions and has been an active participant since the beginning of the initiative. Climate-KIC Innovations works toward the development of a dynamic and open innovation network through a consortium of companies, academic institutions and regional bodies. Climate-KIC is primarily involved as a catalyst for the identification of new channels of innovation related to climate change and the support for existing and future R&D&i projects. Specifically, in the 2011 working plan, the Universitat Politècnica de València participated in two research projects in the category of water studies (AGADAPT and AgWaterUse). Climate-KIC Education seeks to attract and educate future entrepreneurs and agents of climate change through training programmes that combine the science of climate change and the entrepreneurial spirit. For 2011 a programme was set up for master’s degree students (Scholars’ Programme), one for postdoctoral students (Fellows’ Programme) and a third for managers (Executives’ Programme). Climate-KIC Entrepreneurs establishes platforms for networking and supporting the entrepreneur community. Climate-KIC is designed around five geographic clusters that provide infrastructure for local innovation and which in the future will house business incubators as well. Through its regional members, the KIC creates a more direct link between innovators in the field of climate science and an extensive group of potential users of that innovation. So, regions are at the forefront of the Pioneers into Practice programme. CAMPUSHABITAT5U actively participates in this initiative. Climate-KIC Pathfinder will act as a kind of internal consulting agency to deal with the administrative obstacles that hinder large-scale climate science innovation (as a consequence, for example, of the complex interdependencies between technological systems, legislations, economic systems and society). The 2011 work plan features a project led by the “Pioneer Cities” regions in which the Valencian Federation of Municipalities and Provinces is deeply involved. Assessing climate change and managing its drivers: through UJI researchers and the Centre for Environmental Studies of the Mediterranean in affiliation with the UMH (CEAM-UMH). Transitioning to resilient low carbon cities: through the Valencian Energy Agency and the Valencian Community European Region Foundation. Adaptive Water Management: through the UPV and the CEAM-UMH. Zero Carbon Production Systems: through the Universitat d’Alacant and the Valencian Community European Region Foundation. The total budget for Climate-KIC for the first phase (2010-2013) is approximately 380 million euros. Change Mediterranean Metropolises around Time (CAT-MED)CAT-MED is an initiative that brings together eleven Mediterranean cities for the purpose of implementing a “green apple” pilot project before 2013 in each of them. Four Spanish cities are participating in the project: Barcelona, Valencia, Seville and Malaga; three Italian cities: Rome, Turin and Genoa; two Greek cities: Athens and Thessaloniki; and two French cities: Marseilles and Pays D’Aix. The Mediterranean institute provides transnational technical support to the members.The objectives and activities of CAT-MED are framed within the “Territory Planning and Management” area of action of the CAMPUSHABITAT5U project.CAMPUSHABITAT5U, with the goal of integrating territorial, economic, environmental and social factors to achieve a sustainable urban model, intends to use the methodological criteria and the system of indicators defined by the CAT-MED project (Change Mediterranean Metropolises around Time) as a guide.The “green apple” pilot project is a model of a small-scale city that must feature green zones, bioclimatic buildings, and systems for energy collection while also focusing on waste recovery. Furthermore, combining open-rent and government housing in the same structure is also a large part of the CAT-MED project, thereby complying with European social cohesion policies.Therefore, actively participating in the “green apple” experiment from CAMPUSHABITAT5U is a step towards the construction of sustainable cities in harmony with the strategy declared by the capital of the CV itself, and is in keeping with the objectives of the Living Labs university campus programme in the area of sustainable solutions (see details in section 2.3, Transformation of the Campus).The SUPV has already indirectly participated in the “green apple” pilot project of the city of Valencia: Plan RIVA-Russafa (see section 2.7, Participation in the Model of a Sustainable Economy). The master’s programme is made up of four thematic units and is given at different sites depending on the semester: Catanzaro (Italy), Paris (France), Valencia (Spain) and Urbino (Italy).The central content of reCity is the design of urban regeneration practices using a holistic approach aimed at providing the skills needed to convert participants into key players in sustainable urban renewal and development processes, in aspects such as design, communication, construction and the management of the modern city. Promoting academic collaboration for the purpose of jointly providing bachelor’s programmes, master’s degree programmes and lifelong learning with the mutual recognition of credits in Habitat and Territory.